“It is no longer merely a question of ‘using’ instruments of communication, but of living in a highly digitalized culture that has had a profound impact on ideas of time and space, on our self-understanding, our understanding of others and the world, and our ability to communicate, learn, be informed and enter into relationship with others” (CV, 86). Pope Francis warns the short-attention-span approach that “privileges images over listening and reading” can damage our “critical sense." “The web and social networks … provide an extraordinary opportunity for dialogue, encounter and exchange between persons, as well as access to information and knowledge” (CV, 87). 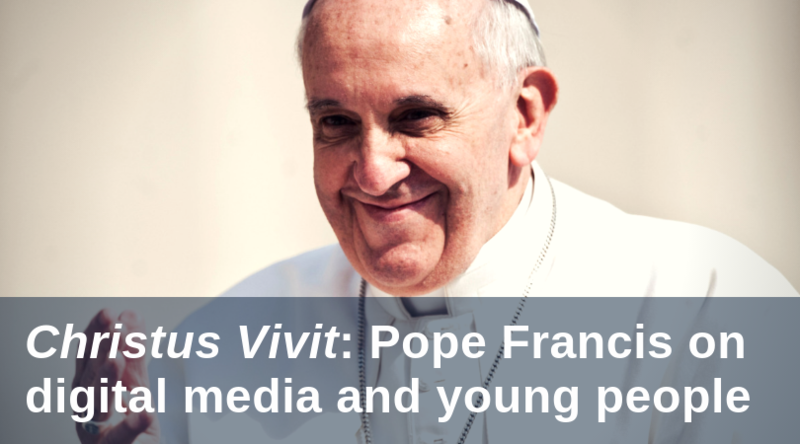 Here, the pontiff is upbeat, appreciating technological incentives for “social and political engagement and active citizenship”; these encourage young people to stand up for the rights of the vulnerable. But he cautions that this new “public square” is not open equally to all citizens around the world. “It is not healthy to confuse communication with mere virtual contact. Indeed, the digital environment is also one of loneliness, manipulation, exploitation and violence, even to the extreme case of the ‘dark web’” (CV, 88). An environment of remoteness “creates a delusional parallel reality that ignores human dignity” and invites a “digital migration” into a lonely world of rootlessness and “self-invention.” Young people “must find ways to pass from virtual contact to good and healthy communication" (CV, 90). “It should not be forgotten that there are huge economic interests operating in the digital world, capable of exercising forms of control as subtle as they are invasive, creating mechanisms for the manipulation of consciences and of the democratic process” (CV, 89). Rushes to judgment in general, fed by our own impatience as avid-yet-unquestioning news consumers and conveyors, do not serve the causes of mercy, justice and accompaniment Pope Francis consistently highlights. A follow-up post tomorrow on Christus Vivit will explore accompaniment as we can implement it in our parishes and communities. “The heart of information is people,” Pope Francis said in his 2018 message for World Communications Day.